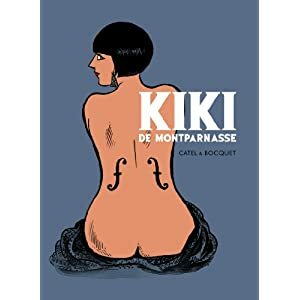 Kiki de Montparnasse is a graphic biography written by José-Louis Bocquet and illustrated by Catel Muller. Kiki was, as I've always thought of her, the woman behind Man Ray, or the woman who inspired him, or, at any rate, the woman he most famously photographed. That is, I'd never given her much thought at all, but she was, of course, more than any of those things. Her name was Alice Prin, she was a model and an artist, and she lived a life. This is actually a pretty thick book, more than 400 pages, which makes it probably the largest comic book I've ever read. 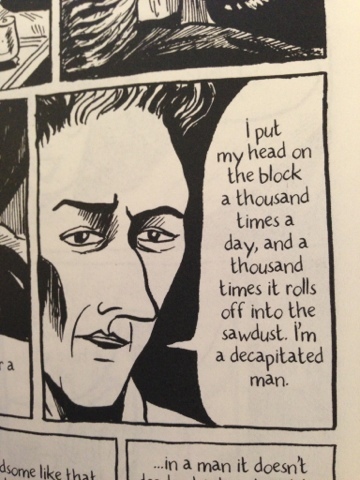 And it's a biography — I don't read much nonfiction at all. So as an impulse purchase, it's a little out of character for me, but one I don't regret. That impulse speaks to how compelling both the artwork and the subject matter are. The story covers the traditional chronological narrative trajectory of a life, from birth to death, and it's very Kiki-centric — there's barely a page where she's not present. That may sound like a stupid thing to say about a biography, but I mean by this that there are no asides or tangents to give historical or other context regarding events or personages that would have an effect on her life. We experience Kiki's life as she did, as it unfolded. 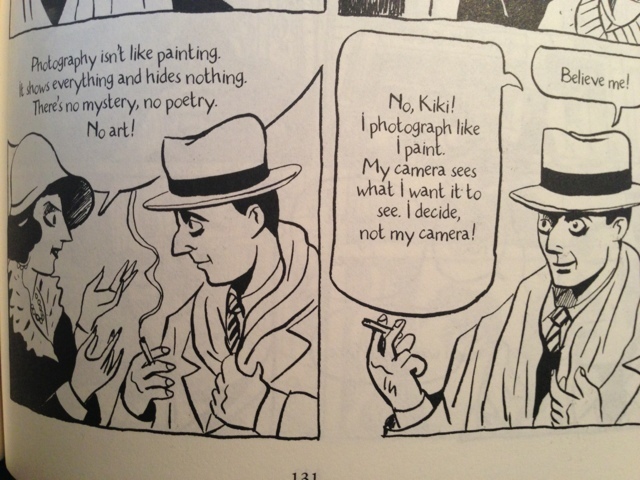 Kiki modelled for, and otherwise encountered, several historical figures better known than her: Modigliani and Picasso, Bréton and Duchamp, Cocteau (right), Hemingway. Thankfully the book includes biographical notes to help identify the faces and provide some background. There's also a timeline. 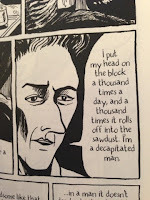 The artwork is black and white, not overly detailed, sketch-like, lively. It lightly skips across the decades of a vibrant Paris, and invites the reader to consider the nature of art, photography, dada and surrealism, love. Was Kiki modelling or whoring? Pitiable hanger-on or self-made feminist? A life of indulgence or artistic sensibility? For a summary of Kiki's life in the context of her Paris, see the four-part blog series by Catel & Bocquet: At the crossroads of the world.